Notes: Major Charlie Brooks is probably best known for his Stonefly patterns which he developed along the Yellowstone River during his retirement years from the U.S. Air Force. Charlie was one of the first fly tiers to study the stoneflies from underwater. He noted that a trout will approach a nymph only if it behaves the same as the naturals. If the fly moved in an erratic way, it would be ignored. A key aspect to behaving naturally, was that the nymph drifted in an upright position just off the bottom with it's back always on top. Thus, trout primarily only saw the nymph's back. 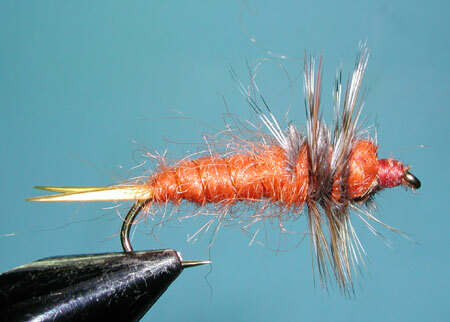 If a nymph pattern was to tumble through the current showing contrasting colors of the top and bottom, the trout would shy away from this presentation. 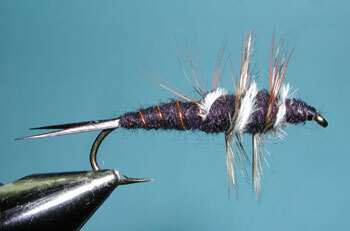 Thus, Brooks' Stonefly patterns were designed by "tying in the round". The prominent Hackles and Ostrich Herl circumference the thorax and there is no distinction between the bottom or top of the fly. These hackles and herl represent the legs and gills as the stonefly is tumbling down a streambed. They are highlighted when contrasted with a darker body and were wrapped twice around the thorax region. Brooks' Stones are also heavily weighted. The lead-free wire makes up much of the bulk of the body. Charlie was known to tie most of his stones with a scruffy appearance and utilized many variations to the pattern. The above pattern with a Rusty Brown coloration of the body can represent both the Salmonfly in sizes 6-8 or the Golden Stonefly nymph in sizes 8-10. 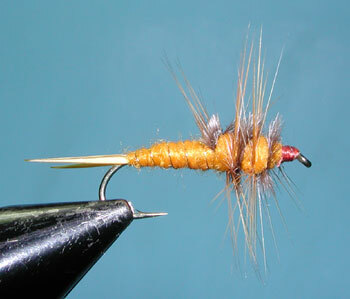 The Amber Goose biots for the tail are fine for the Golden Stone but I would use Dark Brown Biots for a Salmonfly Nymph. The Brooks' Montana Stone in sizes #4-8 is a good representation of the Salmonfly Nymph. Most of the Brooks' Stone patterns will use Goose Biots or Quills for the tail. However, Charlie's original pattern used 6 Crow or Raven Wing Quills. Salmonfly nymphs will inhabit the stream for 2-4 years and migrate once the water warms to about 50 degrees. The migration will start on the lower reaches of the stream and will work upstream. The nymphs will move during the late afternoon and early evening from the riffles to the shallows and eddies of the shore. During the night, they will crawl onto the rocks and foliage along the stream to emerge from their shucks.During this 4-5 day migration, nymphs often become dislodged into the current. Use a drag-free drift along the feeding lanes. The fly needs to have enough weight to bounce along the bottom. The Brooks' Stone, being a very heavy pattern, does a good job in getting to the bottom quickly. The Brooks' Yellow Stone represents the Golden Stonefly, Acroneuria pacifica, tied in smaller sizes (# 6-10) than the Salmonfly Nymph. His Yellow Stone has a yellowish brown body. Two ribs of Gold Wire and Gold Yarn give the fly durability and segmentation.The gold wire rib is tied in at the tail and wrapped forward. The Gold Yarn Rib is tied at the thorax, wrapped back to the tail , then forward again. 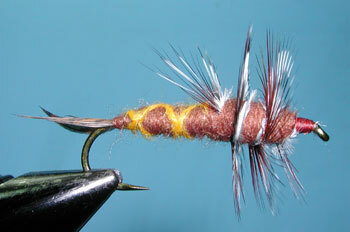 The tail is composed of 2 Turkey quill segments tied with a V style split. Brook's Little Yellow Stone represent the Isoperla stoneflies or Yellow Sallies. It has a much smaller abdomen and thinner profile.